Maru lives in the Carpenter's Shop with her mother, Robin, her father, Demetrius, and her half-brother, Sebastian. Most days she can be found wandering around the community or tinkering with things in her room, though Maru also works part-time at Harvey's Clinic as a nurse. She's an upbeat, curious individual, and won't hesitate to ask questions about your work. Maru's birthday is on the 10th of Summer. Aligning with her interests in scientific pursuits, Maru loves precious stones and Bars, favouring Diamonds, Gold Bars, and Iridium Bars over all others. She's also a fan of sweets, and likes Rhubarb Pie, Strawberries, and to a less extent any Jellies you might make. She also tends to like any vegetables you might grow on your farm, such as Corn, Potatoes, and Pumpkins. Maru tends not to like foraged items and fish, so don't bother trying to give either to her. She also doesn't like common stones, preferring rare specimens, so pawning Quartz and Ores off on her does not work. In Spring Maru seems to like benches, and can be found on one near the Community Center or, a bit later in the day, just south of the Stardrop Saloon. In the latter case she'll be sitting with Penny. In Summer Maru can often be found by the lake to the east of her house, or, sometimes, looking through her telescope at the side of the Carpenter's Shop. In Fall Maru returns to her bench-sitting ways, spending more time near the Community Center than the Saloon. In Winter Maru seems to spend more time indoors, though, as ever, she loves dem benches. Maru seldom stays out late, so if you can't find her, stick near the front of her house - or just wander inside. If she's not there already, Maru should get home before or just after 6 pm. At two hearts you'll get a scene with Maru and Demetrius at her house. At four hearts you'll get a scene with Maru and Harvey at Harvey's Clinic. Maru needs to be working to trigger the scene, so you'll want to enter the Clinic after 10 am on a Tuesday or a Thursday. Honesty is the best policy! At six hearts you can get a scene with Maru by entering the area around her house in the evening, after dark. You'll get a chance to view the galaxy with Maru through her telescope. You may have to push your day pretty late (almost to 12 am) to trigger this scene. At eight hearts you can get a scene with Maru in her house. As far as I know this can happen at any time, so long as she's in the house. 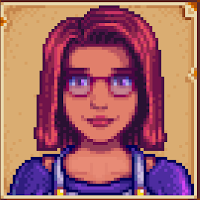 At ten hearts, once you've given Maru a Bouquet, you'll get another scene at her house. Robot! After this you can purchase a Mermaid's Pendant and get Maru to marry you.